Underworld: Rise Of The Lycans - Surprise Of The Year. Already! - Are You Screening? 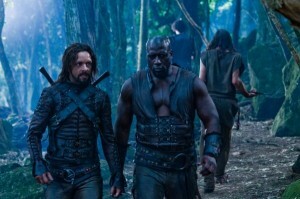 Underworld: Rise Of The Lycans – Surprise Of The Year. Already! 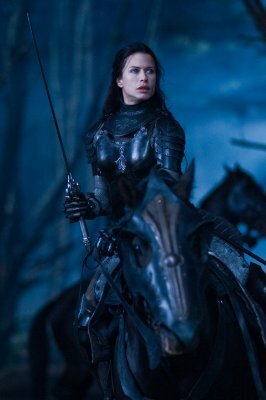 Rhona Mitra is one of the stars of Underworld: Rise of the Lycans, but only in the sense that three characters dominate the movie’s run, and she happens to be one of them. Michael Sheen and Bill Nighy steal the movie, and it is one of the most shocking things I’ve seen in quite some time. Rise of the Lycans takes place several hundred years before the events of the first two films, and gives us the backstory we’ve already had explained to us in those films. Lucian is a Lycan, and he is a slave to Viktor’s coven of vampires. The Lycans work in chains, serving the vampires in a variety of capacities. A select few are given slightly better treatment, and when Lucian manages to save Viktor’s daughter, Sonja, he is somewhat elevated in status. Unbeknownst to Viktor, but beknownst to the audience in fine detail barely after we get out of the gates, Lucian and Sonja are having an affair. Once we have that game firmly underway, the rest of the film plays out much as might be expected. Slaves try to escape. Rulers try to keep them in. Monkeying with the general order of the world are a growing group of wild Lycans. Really wild. The kind with very little human left in them at all. These Lycans are wreaking havoc on the humans, and that is not serving the Vampire plans. After the first thirty minutes, the movie moves forward on a bearing almost etched in stone. If the general principles of the genre did not limit things enough, we’d been told more or less the entire story in the other films. There isn’t much room to roam for our monsters then, and the question is only what can we do with what we’ve got. The answer is rather impressive, because we can apparently do quite a lot. It is mostly the result of Bill Nighy and Michael Sheen putting out two performances that a silly monster flick is not remotely worthy of. Many will be familiar with Nighy by now, even if they are not indoctrinated into the Underworld… world, but Michael Sheen is not quite household material yet. He’s getting a lot of notice for his recent portrayal of David Frost in Frost/Nixon, but his many years as a celebrated stage performer are not liable to have put him on the lips of the masses. Despite his face frequently ripping off so that he can turn into a werewolf, Sheen’s Rise of the Lycans performance might be compared to a Shakespearean role, and that’s probably because he’s done them, and to massive critical acclaim. That’s the strangest sentence I’ve ever been forced to write. But, here’s the thing… it isn’t just a silly monster flick. It is one to be sure. There’s more gore and violence than you can shake a stick at. People are impaled, or have their faces ripped off, or are otherwise turned inside out more times than you can count. The movie is almost completely populated by vampires and werewolves, and they snarl and howl and bare fangs like there’s no tomorrow. But, it is, for all that I can hardly say it, a solidly-crafted film that just happens be to stuck in this genre. The plot is perhaps played out in nearly the simplest possible terms, and there is little subtlety or nuance to ripping someone’s head off, but that doesn’t negate a well-played hand. The characters amount to a strange combination of attempted depth spun around something that defies depth at every turn, but Nighy and Sheen manage the trick somehow. Most importantly, first-time helmer Patrick Tatopoulus builds a wonderfully rich mood and tone. The majority of his credits find him listed under “creature designer” or “production designer,” but he learned the trade. One of those credits is production desinger on Dark City, working with one of the best directors ever, and you can see a bit of Dark City coming through here. The shots, the builds, the angles, and most noticeably the conversations tell of a director who knows how to bring something together on film. The most significant achievement here is the final battle when the Lycans actually rise. I’ll work on the theory that isn’t a spoiler. It’s ten minutes of film you knew was coming from the title, and you knew in any case because you were told it was coming in the previous films. It’s also a somewhat goofy battle of rampaging monsters in a hyper-kinetic lark of movie fluff. Nevertheless, the movie has taken the audience along in such a way that the scene is actually able to deliver an effect. It’s possible actually to rather get behind the Lycans, rallied as they are by their own wolverine Spartacus. It is a wickedly bizarre experience to watch this film. I can only bring myself to give it three and a half stars (out of five), but I’m not sure that a higher rating is actually possible. I can hardly imagine what the film might have done “better” without losing itself in the process, and thus somehow being worse, and at some point I’m okay with that. I have to give it a most serious and sincere recommendation though. If there is any chance you will like this movie… you will love this movie.